Eh Pree (middle) and her brother, Gala Soe, at their family home in Guymon, Oklahoma. “Because my dad, every year he tries to take a picture for a memory,” he said. Gala Soe and his family are originally from Myanmar, members of the Karen (pronounced kuh-RIN) ethnic group. 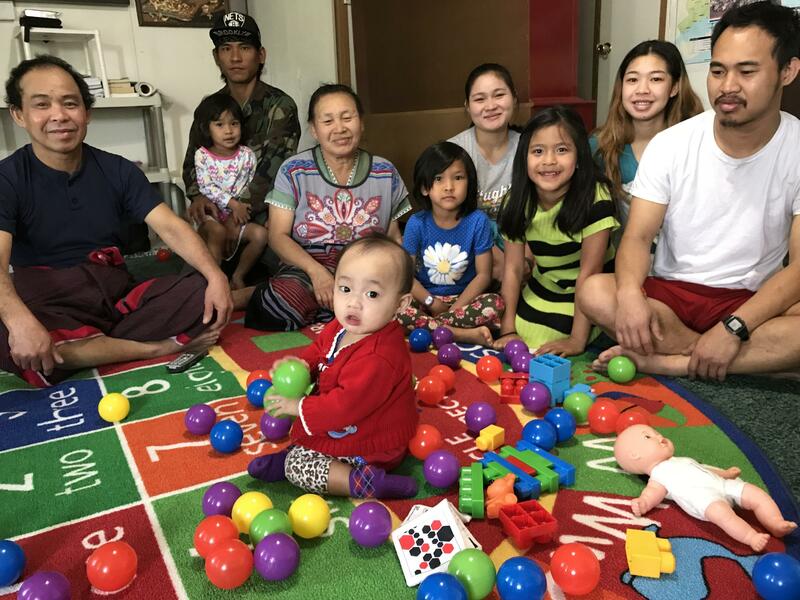 They fled persecution in their home country and spent a decade in a refugee camp in Thailand. Gala Soe said there was little work in the camp, food was scarce and the water was dirty. “That’s why me and my family are really happy that we could come to the United States for a better life,” he said. Gala Soe’s family originally resettled in Connecticut, and moved to Guymon after a few years to work in the Seaboard pork processing plant. Now, nearly every adult member of his family has a job there. The family had never experienced weather extremes like those in Oklahoma’s panhandle. Winters bring single digit temperatures and the risk of blizzards, while summers are hot and dry. Wildfires are risk when it’s dry. Springtime is tornado season. “We live in a mobile home. It’s not really safe,” Gala Soe said. Gala Soe’s parents do not prepare for potentially severe weather or other emergencies. “They don’t really prepare because they don’t know,” said Eh Pree, Gala Soe’s sister, laughing. Gala Sae (far right) and his family at their home in Guymon, Oklahoma. “If you've got an announcement on the radio or the television they wouldn't have a clue what it was,” Wescoatt said. “[The young people] are becoming much more social media savvy and they're able to share this with their parents,” Wescoatt said. About 75 percent of students in Guymon Public School speak Spanish, according to Julie Edenborough, the district’s director of migrant services. “Just normal communication is complicated and I do have concerns when there are emergencies that we don't have the communication that we need,” Edenborough said. A strong blizzard hit Guymon a few years ago, not long after the first refugees from Myanmar arrived, and some children from the country did not know schools had cancelled classes. “They waited at the bus stop in 30 mile per hour wind with the wind chill...close to 20 below for the bus to show up,” Edenborough said. She said the school sent messages to the English and Spanish radio stations, but that didn’t help the students from Asian or African countries. English language teachers now call each home whenever school is cancelled. “That's kind of above and beyond the teacher's responsibility but that's all we could do,” Edenborough said. The linguistic challenge is one of many obstacles Guymon officials face in preparing the community for severe weather. Refugees and immigrants can also be scared of authority figures and warning siren tests. “We find post-traumatic stress syndrome reveals itself a lot of the times in the refugee kids,” Edenborough said. Edenborough and her teachers teach new students about the warning sirens. They also tell parents about sirens and tornado shelter locations during home visits and parent-teacher meetings. Don Stull, professor emeritus of anthropology at the University of Kansas, has written on the meat packing industry and its effect on communities. He said it can be difficult for law enforcement officials and government agencies to build trust with refugee communities because they are fleeing persecution in their home countries. Guymon is not the only community on the Great Plains with a large number of refugees and immigrants. Places like Garden City and Liberal, Kansas and Lexington, Nebraska have also experienced an influx of foreign-born residents after meatpacking plants set up shop. Stull said packing plant managers view immigrants and refugees as hard workers who are less likely to unionize. The meat industry has changed dramatically since the 1960s. Meatpacking companies, originally centered in large urban areas like Chicago and Kansas City, gradually moved to smaller communities away from cities. Stull said the companies turned to immigrant labor, at first primarily from Mexico and Central America, because these small towns often didn’t have an adequate workforce. Stull said modern companies increasingly seek refugee labor. “Refugees are in this country with authorization. Immigrants may or may not be,” Stull said. “I thought I was really gaining a lot. And now I got so many others that I just haven't been able to afford it,” Tyson said. “You can't just cookie cutter a message and say, 'Oh, I'll take this message in English and translate it to Somali,’” said Dennis Andrulis, a researcher at the Texas Health Institute and professor at the University of Texas Schools of Public Health. “The person from the government...said, ‘Well we translated it.’ And the person from the Hasidic community said, ‘But we won't read it,’” Andrulis said. Andrulis said government officials need to develop trust with these communities and engage them to figure out what is culturally acceptable. “The churches and schools and community-based organizations there are the ones who know and they're the ones who will also help gain that trust,” Andrulis said. Mark Wescoatt, the Lutheran pastor in Guymon, is an example of an effective intermediary. For the Karen refugees in Guymon, he’s a familiar, friendly face. “They know that that I joke a lot, but it's that they trust me. I guess that's it. They do trust me,” Wescoatt said. And it’s that trust that can help families stay out of harm’s way. Support for this article was provided by the Weather Eye Award, an award given to distinguished local reporters by RiseLocal, a project of New America’s National Network.